The casuarina-lined coast of East Bay Cay. Part of the East Bay Islands National Park and in the general Bottle Creek area, this low lying 1500 acre (600 hectare) island is found next to the northeast coast of North Caicos. 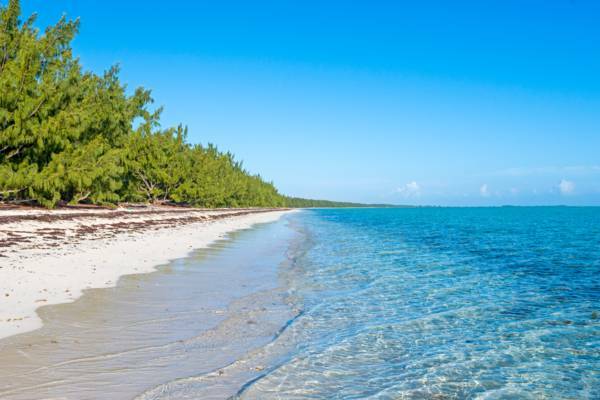 Not to be confused with its adjacent neighbor Bay Cay close to the north, East Bay Cay offers a beautiful Casuarina Tree lined 3.3 mile long (5.4km) white sand beach on its east coast, and extensive mangrove wetlands off the west side. Uninhabited and rarely visited, the main activities in the area are day trips by boat or kayak from North Caicos. Due the beach on East Bay Cay is excellent for flotsam beachcombing due to being exposed to the east trade winds. The entire north face of the cay is a narrow white sand beach.